This weekend we had to euthanize our beloved cat Jesus (“Hay-zuss”). We’d known the decision was imminent ever since he was diagnosed with a fatal illness called “Feline infectious peritonitis” a few weeks earlier. He’d been waning ever since August. Coughing, wheezing and sneezing had us hauling him in to the vet again and again. Antibiotics were prescribed, to some benefit, but then matters would go downhill again. He’d been steadily losing weight and becoming listless and withdrawn, a shadow of his former super friendly and funny personality. As anyone who has loved a pet knows, it is heart-breaking to see them suffer and equally heart-breaking to say good-bye. Jesus had been our “best cat ever” (no offense to our other cat Bijou). In recent weeks, we showered Jesus with extra attention and “cat-talk” and love, knowing the end was near. We waited for a sign from him, and when he began holing up in a cupboard and then peed inside it without trying to leave, we knew the sign had been given. I’ve been reflecting on the mysterious and beautiful gift that pets are to us. They bring love and laughter into our lives and we become closer to each other because of them. 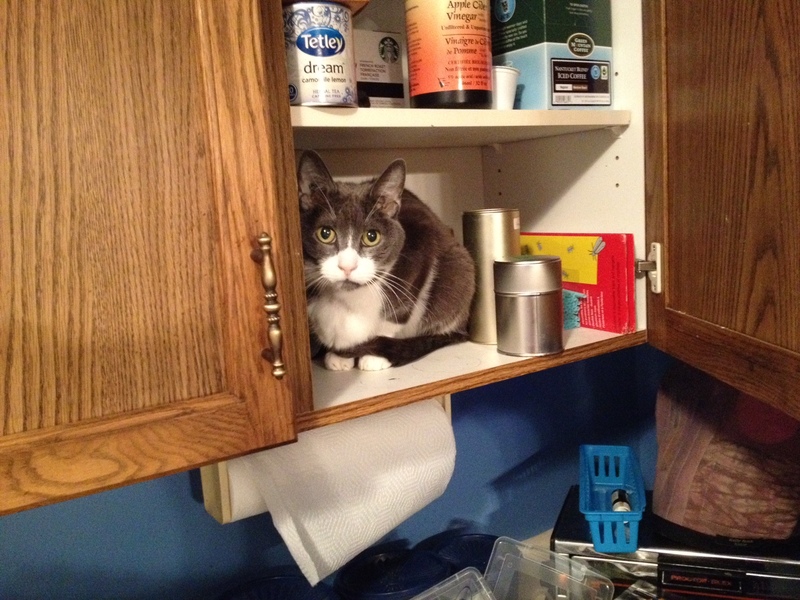 Cats especially serve no practical function at all, and yet they are such a gracious addition to a home. Cats always offer a counterpoint to our often too-busy lives. While we count the minutes and plan our lists, cats are content just to snooze away the hours and remind us that it’s ok to slow down to attend to the non-urgent but important activities of our lives such as reading books and spending time together. We got Jesus, along with another adult cat named Bijou, from D’Arcy Arc no kill shelter in 2005. We didn’t choose his name; his previous family did (along with a brother named Diablo, or devil). But we thought it fit for him as he seemed divine to us. We hadn’t always had the best of luck with animal choices. Pet troubles seemed to echo the marriage troubles of our early years together. We tried getting a dog, twice, but each time had to find new homes for them as the experience caused too much tension in our home. 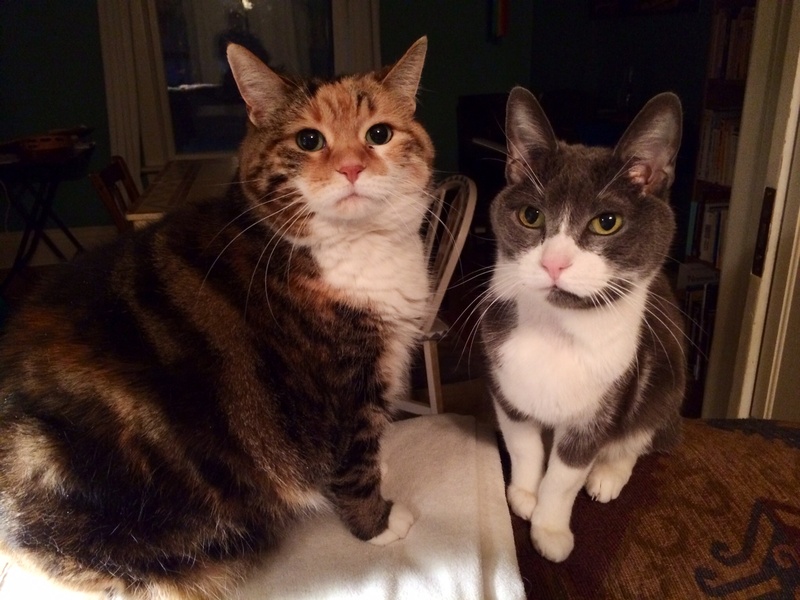 We’d had 6 or 7 cats before these two, and some drama or other would often unfold as well. When a good balance between animal and humans happens, it is such a gift. Bijou is a more independent cat but Jesus immediately began to endear us to him with his quirks. He spent the first week in our house hiding under the bed as though we were threateningly waiting with axes. I spent that first week lying on the floor beside the bed, cooing and coaxing him until he would finally flip over and start purring, letting me rub his tummy. When he finally realized life was safe enough to venture out, we thought all would be well until one morning he slipped outside and was gone. We searched the neighborhood for 7 days, but it was the rented cat trap that brought him back to us. In the meantime, we got to know kids in the neighborhood who had joined our search. Our adventure ended with Jesus back with us, and Lyle also wrote about it in the local newspaper. Gently pawing at my hands whenever I had my head buried in my hands with a headache, getting me to look up and pet him. We all need a reason to look up from our troubles. And, the best ever, sleeping right beside you in bed or on the couch. It was a consolation to me to remember the verse in recent weeks that the God who cares even when the little sparrow falls, (Matthew 10:29) cares immeasurably about cats as well. There is no situation that God is not present, as small as it may seem to us. And no doubt God has received our beautiful feline friend into “kitty heaven” with much joy. The day we received the diagnosis from the vet, Lyle synchronistically found this prayer on the death of his cat Tuck in a book he was reading by theologian Stanley Hauerwas. I’ve changed the words to fit our cat. ‘Passionate Lord, by becoming one of us, you revealed your unrelenting desire to have us love you. As we were created for such love, you have made us to love your creation and through such love, such desire, learn to love you. We believe that every love we have you have given us. Jesus’ love of us, and our love of him, is a beacon, a participation, in your love of all your creation. We thank you, we sing your praise, for the wonderful life of this cat. His calm, his dignity, his courage, his humor, his needs, his patience, his always “being there,” made us better, made our love of one another better, made us better love you. We will miss him. Help us not fear remembering him, confident that the sadness such memory brings is bounded by the joy that Jesus existed and, with us, is part of your glorious creation, a harbinger of your peaceable kingdom. Amen. When Winnipeg winters get colder than Mars and there’s nowhere left to heap the snow from my shovel, there’s nothing I love more than hunkering down with one of my favorite genres of book – the survival story. Maybe it began in elementary school when I read the book The Incredible Journey, about three pets as they travel 480 km through the Canadian wilderness searching for their beloved masters. I love how it seems that everything is lost until small mercies come along that help the main characters in imperceptible but life changing ways. Two weekends ago, I received one of those small mercies which had the effect of renewing my energy and stirring up a deeper sense of hope in God and life. 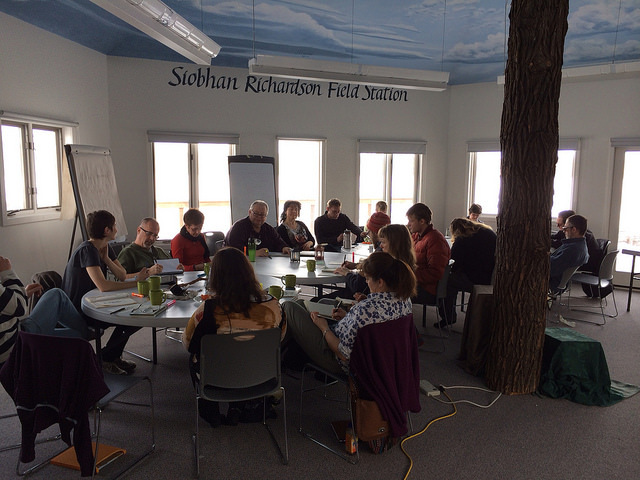 Our community hosted a story-telling workshop out at Fort Whyte, Winnipeg’s beautiful nature centre. As I listened to the stories others had prepared, and then spent time on Saturday writing my own stories, I became aware of a deeper stream. Instead of being caught up in petty worries and cares, I was reminded of something greater than me flowing beneath the events of my life. I was struck by something as I wrote some of my own reflections. As difficult as life can be, what we focus on makes all the difference. Much like writing in this blog, I spent time remembering the small kindnesses that have come my way since the year began. Reflecting on these experiences from myself and others cracked my heart open again and melted it with the warmth of God’s compassion. 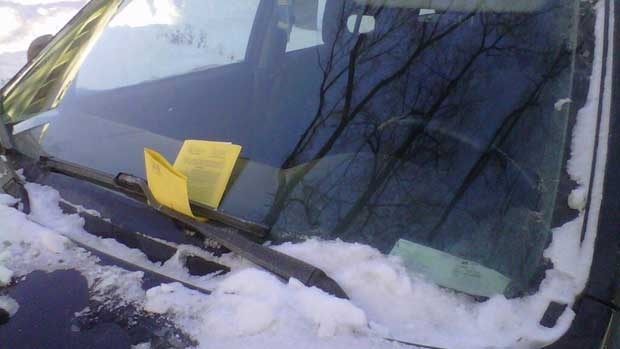 For example, on the first day back at school in January, my car was towed due to snow clearing. That was a bummer, but it was people’s responses that really warmed my heart. Two loyal parent volunteers were on the case right aways. One told the other who went out around the streets looking for where they’d towed my car. Within ½ hour, they had a report to me about where my car was. For some reason, this small act of kindness and loyalty touched me deeply. Later, our kindly and almost saintly Polish custodian took time to commiserate with me about the ticket and almost said the f word in my defense. The great poet Rumi has famously said, “Someone fills the cup in front of us.” For me, this Someone is my friend Jesus. The more I look, the more I see his representatives all around me, being Jesus’ hands, feet, words and actions. Like the three pets in The Incredible Journey, we are all lost in many ways, searching for our master. Yet we are not actually lost at all if, like the parents looking for my car, someone is looking for us. I left the weekend strangely encouraged and with a lighter heart. I say strangely because I couldn’t quite explain it. The workshop had really only been less than 10 hours, and nothing fancy had happened. But I felt the effects for days after, the feeling of having been touched by God and that everything would be ok in my life. And now as I write about it more than 14 days later, I still have that sense. An old friend sent me a verse for my birthday on Facebook this week, and it has stayed in my heart all week. “In quietness and confidence shall be your strength.” Isaiah 30:15 (Thank you Rita Mae.) The first part of the verse talks about returning to God and resting in God. Focusing on all the small mercies is about going to a quieter place within, away from the worries and cares of life.These things keep me steered toward God every day, like the rudder of a ship. I am thankful that God sees fit to hand over these mercies so regularly so I am not left to my own devices.